PuzzleMad: Both Metal and Plastic can be Sublime and Ridiculous! Both Metal and Plastic can be Sublime and Ridiculous! If you are wondering whether my pile of mixed puzzles is sorted yet then the answer is HELL NO! I managed to sort 3 of them out by wood type and was able to reassemble them but the 5 oak Happiness cubes continue to taunt me and make me very unhappy! Partly because I have had no time to even attempt the task. At the MPP I could not resist picking up the latest 2 sublime creations from the deviant minds of Ali and Big Steve (yes, I chose that word appropriately). 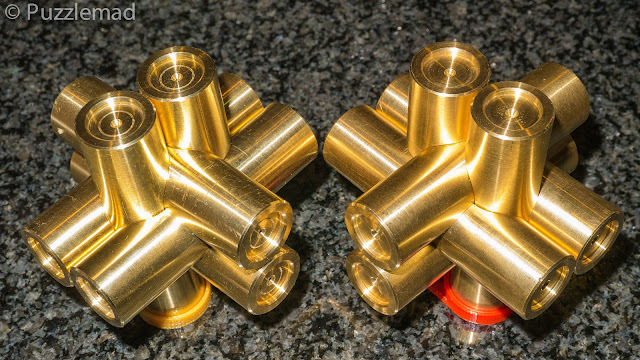 Their store on Etsy is called the Two Brass Monkeys and their creation above is Brass Monkey 1 and 2 (there is also the fantastic Hokey Cokey lock for sale as well - review here). These beauties are made of brass, are about 7cm around and weigh 800g each so postage outside of the UK may be a little high. 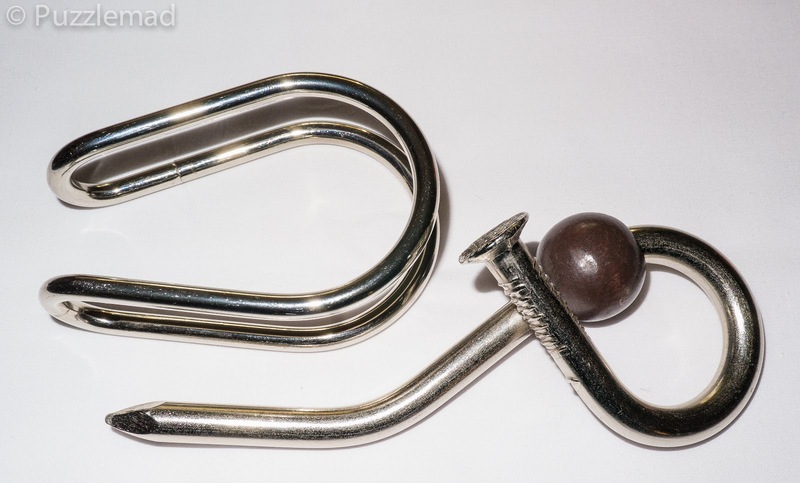 Nick Baxter didn't have to worry about postage having received his at the MPP - unfortunately for him, he did not know that he had received it until he was frisked by the TSA and had to explain what this heavy metal thing was and whether anything was inside of it! When I showed it to Mrs S the evening I got back from Birmingham she did indeed say that they were very beautiful. The following day, she seemed less enamoured of them when she realised just how heavy they were and what would happen if I dropped one on a large high gloss kitchen tile or the granite worktop! They were banned from the kitchen! I went to work on BM#1 on Sunday evening (in the living room whilst watching TV with the cats and Mrs S. I realised quite quickly that this was a lovely example of a classic burr puzzle. It is not terribly difficult to dismantle and the reassembly is only slightly more challenging. It is a wonderful example of the metal craftsman's expertise! The attention to detail went even to having a sprung ball bearing to allow the key piece to click into place. 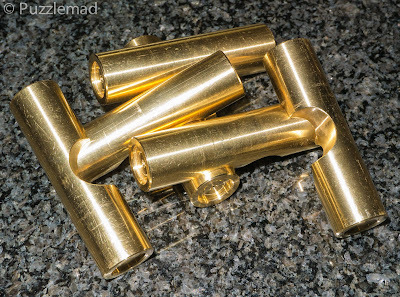 Flushed with success, I went to work on Brass Monkey #2 and quickly realised that this burr was much more complex. There was pushing and pulling and lots of grunting and groaning as the weight of the bloody thing got to me! At the end of one evening, it remained intact and I remained frustrated. The next evening, I continued to play and again had no luck. I sort of ran out of ideas and put it down for the next few evenings. No inspiration occurred to me and I started on some other puzzles instead but always having it next to me on my armchair. I could hear Big Steve taunting me! I was on call on Friday night and it was a rather busy night in Sheffield so lost an evening's puzzling. 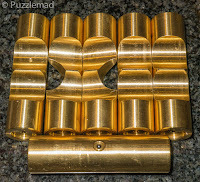 The following morning, feeling rather jaded from lack of sleep, I was reminded by Steve that I needed to actually pay for the puzzle and at the same time taunted by him that George Miller had solved his copy in just half an hour! PayPal did its' thing from my bed and I suddenly had a brainwave - maybe if I look closely at..... At this point, Mrs S told me I had better get out of bed and get to the gym because if I get fat she will get rid of me! Thus I was unable to try out my wonderful idea. At the gym, I managed not to die on the Cross trainer and stepper and thought more deeply on the Brass monkey. Concentration is not my strong point and I quickly got sidetracked and gazed admiringly at the ponytails jiggling about when they turned around, they appeared to be blokes...this was a great disappointment! 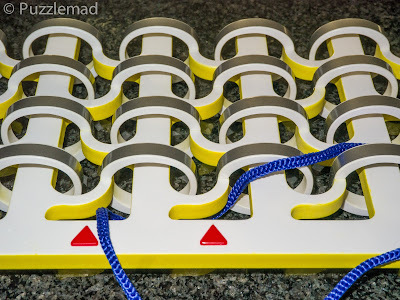 As soon as I got back from the gym, before breakfast could be made and consumed, I pissed off Mrs S by going straight to the puzzle and bringing it into the kitchen and tried out a new theory. Aha! Mrs S said that Steve and Ali were very "sleekit" (old Scots word c.f. Robert Burns) - yes, it is a very sly/cunning idea and I am slightly ashamed that I didn't solve it quicker. Of course, I am not going to show the mechanism. They will look great on the shelf but before I put them on it, I will need to flip it over because my shelf of metal puzzles is starting to bow under the weight! Huge nail-ball-U - I have no idea whether it has a proper name! Another really lovely bit of heavy metal came my way a month or so ago courtesy of the wonderful Wil Strijbos. His latest meeting with Jean-Claude Constantin gave him a bunch of new disentanglements which I was keen to try. 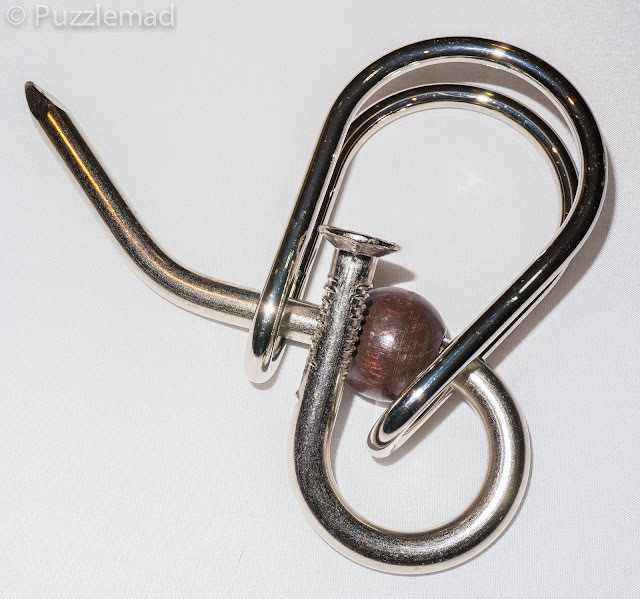 JCC has been playing with the horseshoe shapes in quite a few of his puzzles recently and they have turned some easy puzzles into something absolutely horrendous. The monster above (it is 232g in weight and 15 x 12cm in size) must have taken quite some machinery to produce...the nail is the biggest I have ever seen! Looking at it, one immediately gets an idea for what one needs to do but, as always, that is blocked. Try it in the opposite direction and...nope! That won't work either. There is no way that you could ever flex it a bit to make something slip past - this requires exactly the right movements to make it happen. The jingling (more like clanking) got on Mrs S' nerves but it was worth it - 30 minutes of noise and my Aha! moment was there. Superb idea and so much better for being made large! Such a simple design but not a simple solution! 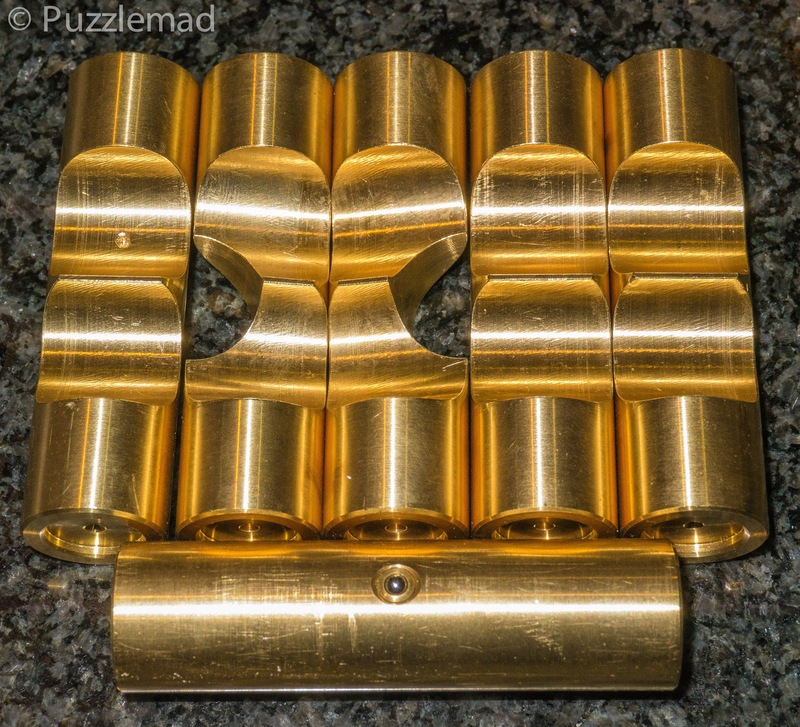 Next up I have to show off what many might consider "ridiculous" - I am a huge fan of N-ary puzzles (something is on its' way over to me very soon) and also a huge fan of probably the greatest exponent of that group of puzzles, Namick Salakhov. Every year Namick enters some of the most incredibly complex designs into the IPP Design competition and I drool over them. He had several entries this year and this is the second of them that I have managed to get hold of. They are handmade from a kind of plastic and are lovely to hold and play with. 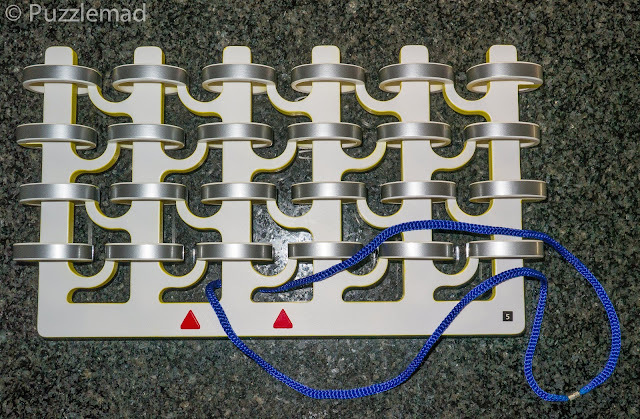 This one is the Loopy Lattice puzzle with the aim being to remove the string...without scissors! So far the solution has eluded me but Nick Baxter assures me that it is solvable and the solution does fit on a single sheet of paper! Luckily Namick puts a small link in them that allows you to unscrew the loop and reset the puzzle. Without that, I would have had the most awful knot!! One feature that makes it even harder to solve is that every time I start to play, one or both of the cats decides that it is time to play with the string and tries to bite through it! I am determined to get it solved. Before I do that, maybe I should get to work on my happiness cubes? Don't forget to go buy the Brass Monkey puzzles whilst you can. My Happiness Ends With a GiganTIC Bang!